WASHINGTON ― As American, British and French ordnance rained down on a trio of Syrian regime targets, Russian air defense systems made no attempt to intercept the weapons, the Pentagon said Saturday. The attacks may have set the Syrian chemical weapons programs back for “years,” said Marine Corps Lt. Gen. Kenneth McKenzie, the director of the Joint Staff, while acknowledging that the three sites were not the totality of the Syrian chemical weapons program. 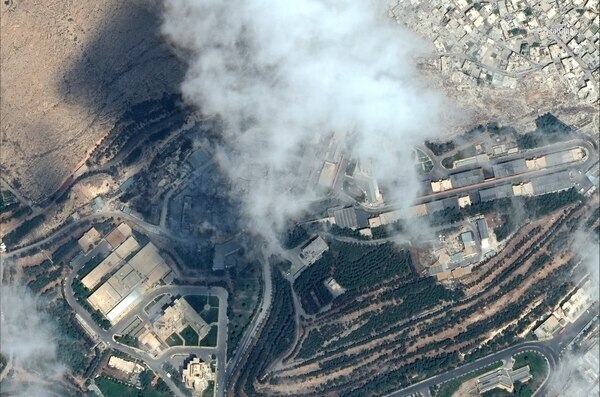 The Barzah Research and Development Center, which McKenzie called the “heart” of the chemical weapons program for the Assad regime and is located in “one of the most heavily defended” areas in the world, very close to the capitol of Damascus. This site was targeted by American forces only, with 57 Tomahawk missiles launched by sea and 19 JASSM-ER weapons launched from a pair of B-1 bombers, accompanied by protective fighter coverage. The U.S. assesses this facility was destroyed. The Him Shinshar Chemical Weapons facility, located west of Homs, which was hit by all three nations. The U.S. launched nine Tomahawks, the British launched eight Storm Shadow air-launched weapons from a mix of Tornado and Typhoon fighters, and the French launched three naval cruise missiles and two of their SCALP air launched weapons, which are their Storm Shadow equivalent. The U.S. assesses this facility was destroyed. The Him Shinshar Chemical Weapons bunker, about 7 kilometers from the previous site. This was struck only by the French, with seven SCALP missiles. In both locations, the SCALP weapons were fired by Rafale fighter, accompanied by Mirage fighters for protection. This location took “damage,” per McKenzie. Much had been made about the intensity of the air defense systems in Syria, a combination of Syrian and high-end Russian defense systems. Russian news outlets, as well as social media from the region, had claimed as many as 70 percent of coalition weapons were shot down by Syrian or Russian air defenses. But the Russian systems did not attempt to intercept the incoming weaponry, and the Syrian system launched around 40 surface to air missiles after the last targeted weapon hit its target, according to McKenzie. Overall, the air defense systems were “remarkably ineffective in all domains,” McKenzie said. Did any of the U.S. missiles fail en route to Syria? Defense News deputy editor Aaron Mehta asks if any American missiles failed during a briefing following coalition strikes on Syria. However, McKenzie noted the S-400 systems were not turned off, simply not activated, leaving open the option their radar systems were used to tracking incoming threats but the weapons systems were not fired. That those systems were active but not used could also be a sign that the deconfliction line between the U.S. and Russia, which was used to urge Russia not to escalate the situation, had been effective. At this time, the department believes there were no civilian casualties associated with the strikes, which occurred around 4 AM local time. None of the allied air assets entered Syrian airspace, due to the stand-off weaponry used. As a result, there were no F-22s used to accompany the B-1s for air protection. Instead, the bombers were accompanied by a single EA-6B for electronic warfare suppression, potentially against Russian air defenses, as well as tanker support, according to a Joint Staff spokesman. The inclusion of the EA-6B is notable, as that aircraft was officially retired by the Navy in 2015 in favor of the more advanced EA-18G Growler, but is still in use by the Marine Corps; its presence indicates that three of the four U.S. military branches took part in the still-unnamed operation. The 19 launches of JASSM-ER from the B-1 on Friday appear to be the first-ever use of the weapon in combat. Both JASSM and its extended range version are long-range, air-to-ground missiles made by Lockheed Martin, and they feature a stealthy air vehicle, GPS guidance and an infrared seeker. JASSM-ER has almost twice the range of its predecessor — in excess of 500 nautical miles, while the original version was limited to around 200 — which could have enabled the B-1B to remain at a standoff distance from Syrian air defenses while launching the attack. As part of a coordinated, allied strike against Syrian chemical weapons targets, British and French aircraft take off to conduct those strikes. JASSM-ER entered service with the Air Force in 2014, with the B-1 the only aircraft initially able to launch it. In February, it achieved full operational capability with the F-15E, and the missile is currently being integrated with the F-16C/D and B-52. The U.S. has about 2,000 troops on the ground in Syria, who are supporting the on-going mission to defeat the Islamic State militants that remain in the region. The missile attacks Saturday morning fueled some concern that those troops could be vulnerable to retaliatory attacks from either Russian or Syrian forces in Syria. So far the U.S. has yet to see launches of Syrian or Russian jets for a potential response, but McKenzie said the U.S. would be keeping a heightened air defense package flying in the region “for a while” as the situation develops. 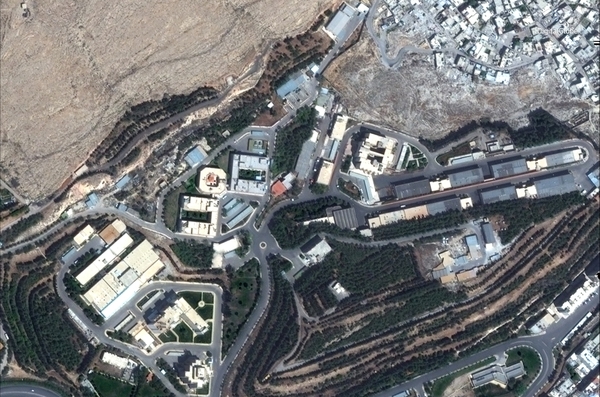 The bulk of U.S. seapower was employed against the Barzah Research and Development Center in Damascus. A total of 57 Tomahawks were fired the at the facility, which the U.S. considered the heart of Syrian chemical weapons program, said spokeswoman Dana White. An additional nine Tomahawks were fired against a chemical weapons storage facility in Homs. In the Red Sea, cruiser Monterey fired 30 Tomahawk cruise missiles, and the destroyer Laboon fired seven Tomahawks, McKenzie said. In the north Arabian Gulf, destroyer Higgins fired 23 Tomahawks. In the Mediterranean, the French Frigate Longuedoc fired three versions of their variant of the SCALP missile and the Virginia-class submarine John Warner fired six Tomahawk cruise missiles. This is believed to be the first known combat use of a Virginia-class submarine. On Saturday morning, U.S. President Donald Trump tweeted “Mission Accomplished,” a throwback to the famous statement from President George. W. Bush following the initial invasion of Iraq. Both McKenzie and Pentagon spokeswoman Dana White would not rule out future strikes in the region, saying that is entirely up to the Assad regime. The use of chemical weapons in the future could lead to more strikes, they said. The strikes took out “the heart” of the Syrian chemical weapons enterprise, but McKenzie acknowledged that there are other facilities that were not struck due to concerns about civilian casualties. He declined to say exactly how much of the chemical weapons program was taken out. The U.S. carefully plotted out the strikes to minimize the potential for chemical weapons to leak out of the facilities, with McKenzie saying “we believe we successfully mitigated” the risk. In addition, while it is possible that some material and people were moved from the site in the lead-up to the attack, there were certain pieces of equipment that would not have been able to be relocated, he said. These sites are believed to be involved in producing a mix of chlorine and sarin, he added. Chemical weapons inspectors arrived in Damascus today and are expected to inspect the sites. Unlike the strikes against Syria last year, these strikes were designed to directly impact the chemical weapon development process, as opposed to the delivery systems. White closed her briefing with a warning that a wide-scale disinformation campaign is underway, warning the department had seen a 2,000 percent increase in “Russian trolls” since the strike. The department did not explain how they determined that figure or what the activity was based around. Valerie Insinna in Washington and Jeff Martin in Tampa, Florida contributed to this report. This story may be updated as new information becomes available.